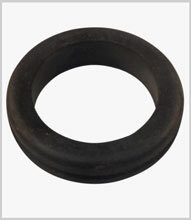 Rubber and PVC grommets for sealing and protection of cables and pipework, also for vibration damping. Open grommets – also closed/blind grommets and various other shapes – in metric sizes from 6mm to 50mm, imperial ¼” to 2″ internal dia. Bulk single sizes and kits of varying sizes.